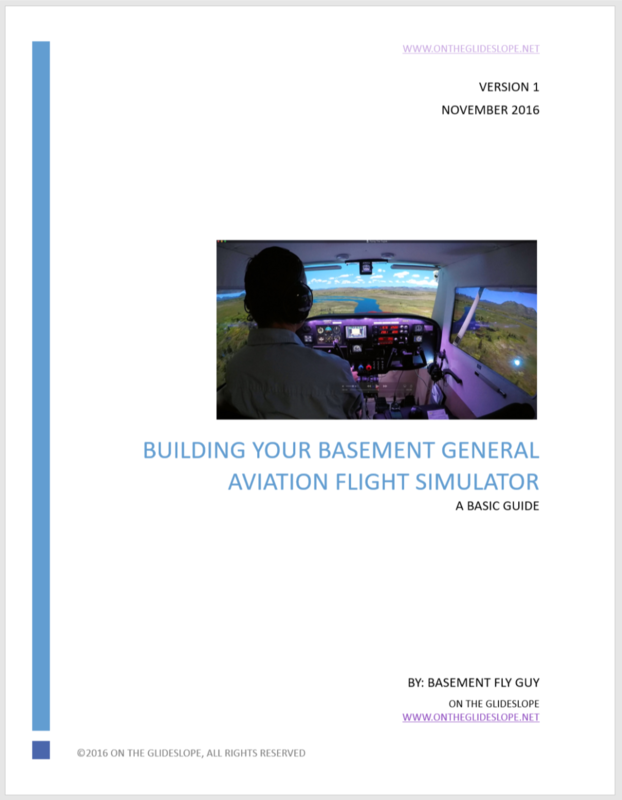 I’ve been trying to post more and more information that can help folks build their own Basement Simulator, and have finally decided to take the plunge and write a guide on the topic. I do NOT want to offer something that goes into significant detail about the software, hardware, and PC side of things, as Sim Samurai’s Ultimate Guide To Advanced Flight Simulation achieves that with far greater detail than I’ll ever have to offer. (And if you’re planning to build a home sim and haven’t purchased the UGTAFS, I can say it was one of the first things I did when I got started, and it’s worth the price.) Rather, I want to offer something that describes in reasonable detail the design I’ve used, choices I’ve made, and lessons I’ve learned in building the Basement Sim — including plans, tools, and parts — so that others who wish to build a similar GA cockpit can more easily do so. My vision is something that will be enough of a detailed resource that someone could use it to build and start flying in a sim like mine. I began producing the guide yesterday, and have 18 pages written so far, including side, front, top and back plan elevations. I hope to complete it sometime next week. Because of the time and energy invested, I do plan to offer the guide for sale, and expect to do so for somewhere around $30 with a full money-back guarantee if people who buy the guide aren’t satisfied with it. I figure the experience I’ve put into it is probably worth that, but we’ll see. Projector Or TV Front View? So stay tuned! I hope it will be a valuable resource for others looking to pursue the hobby as I have. Doooood! Am I blind, or have you not demonstrated your wonderful new avionics for us??? So any updates on when its being released ?? Hi, I am about to cut wood and screw screws and I would be more relaxed if I could see your guide To Building A Basement GA Flight Simulator. If the final version isn’t going to be available in the next week, could I see or buy the beta version and then you can send me the final version when it’s available ( cf X-Plane 11)? In the meantime, what size and length of woodscrew did you use for the frame joints? How many per joint (1, 2, more)? You might have guessed I’m not a carpenter so I need a lot of hand holding. Thanks in advance. Hi Chris. Please check your email and thanks. The original design you benefited and designed from was not sold to you. Why are you selling the design. Why not post it for all to consume? John, my schematics, panel schematics, screen configurations, center console plans, and modified aircraft configuration files are already posted here for free. I did not work from any plans, but I did work from FlightSimLiberty’s one video walkthrough of his cockpit for inspiration. So I actually believe I’ve been quite generous with my work and my advice, and of course you are welcome to disagree about that. The book I’ve been working on is not just a set of schematics. It’s a 70-page overview of everything I have learned along the way. In creating my cabin I learned a lot from Sim Samauri’s book on cockpit design. I paid for that and it was worth every penny. The website, forums, and YouTube resources I provide I maintain and pay for out of my own pocket and advertising comes nowhere near recouping that. I figure that if I’m going to take he time to write a book in my experience it’s reasonable to receive some compensation for it. Loving your site (visit it several times per day lately). Started collecting the parts for my sim and would love to buy your ebook when it’s available. Any word on how that is coming along? Thanks and thanks so much for the excellent content you continue to release. I am also interested in your guide. When will it be available? If it's your first time here and you want to learn more about the basement simulator, you might begin with What’s In The Sim. Or you might see answers to some of the common questions I get about the sim, like "What are the cabin dimensions?" and "How do you configure your screens?" Finally, there is a video tour of the sim here. Thanks for stopping by, and please come by often. Enter your email address and I'll notify you of new posts via email. A few Google dollars help keep the sim running. I don't get to pick these ads, so I can't vouch for them, but I hope there's something here of interest to you. NOTE: I am a hobbyist and private pilot student sharing my experiences in simulation and flight training. Do not use my content for flight instruction, for which you should consult a Certified Flight Instructor. Thank you. www.ontheglideslope.net is licensed under a Creative Commons Attribution-NonCommercial 4.0 International License. Or email me at ontheglideslope at gmail dot com. I’d love to hear from you.